In this day and age, theme-park guests of all types want to be online and ready to share photos, videos, and the thrills of their vacation. (We don’t blame you – after all, Orlando Informer is on many social networks ourselves, including Twitter, Facebook, and Instagram.) This is especially the case now that Universal Orlando offers free resort-wide wifi. However, after all this sharing, we are commonly asked how guests can charge their phone while visiting the resort. 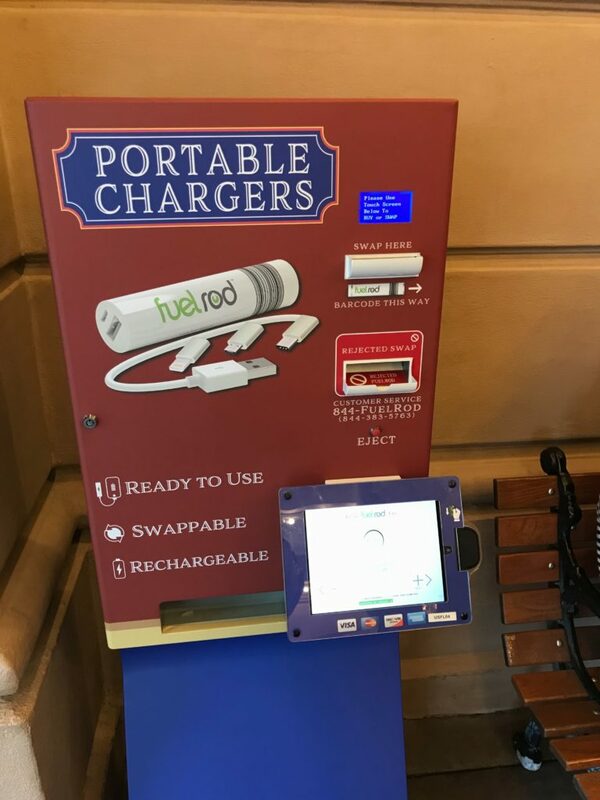 As of February 2019, Universal has a new answer to this: FuelRods are available for purchase at Universal Studios Florida, Islands of Adventure, and CityWalk. A FuelRod is a reusable portable charging system – the company boasts that it’s the first of its kind, with the “highest energy density on the market” – for smart phones and tablets, delivering up to eight hours of talk time on the average phone or up to four hours of usage on tablets. Once the rod (battery) you have rented is drained, you can always swap it out for another one (for a fee at Universal, while it’s free at other theme-park locations in Central Florida, such as Walt Disney World Resort). How much is it to rent a FuelRod? Where can I buy a FuelRod? There are five locations: in Universal Studios Florida’s New York (near the Palace Arcade) and World Expo (next to the Men in Black: Alien Attack gift shop), in Islands of Adventure’s Marvel Super Hero Island (right next to the Toon Lagoon border) and Jurassic Park (by the Jurassic Outfitters gift shop), and in CityWalk (near Guest Services). Can I just use a nearby outlet at the resort to charge my phone? While it’s unlikely for it to be an issue, outlets at the parks are not for guest use and you may be asked to unplug your device by a team member. Volcano Bay, Universal’s new water park, doesn’t offer FuelRods at all – but since you probably won’t have your phone on you during your aquatic day, this shouldn’t be that big of an issue.